Every career is filled with firsts. I remember each of mine - my first wedding (Jim and Dale), my first commercial shoot (a power drill) , my first cover (a moody shot of handsaws), my first editorial (in PhotoMaster magazine) , and now, my first billboard. 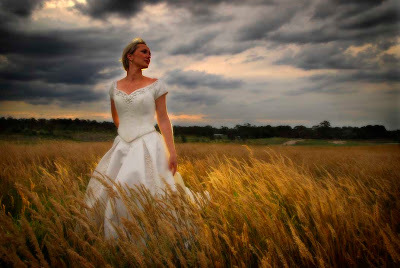 On the Western Hwy as you head toward Melton from Melbourne CBD is a billboard that features this image. I am yet to get there and photograph the actual billboard myself as it is an hour and a half's drive from my home. But I will get the shot, as of course we all need a photographic record of our firsts. 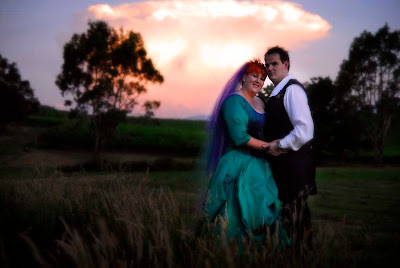 However if you want to see my first wedding...forget it. I think I would be too embarrassed! The cover? Different story. I loved it. So did the editor. Now where is that copy of the magazine...? 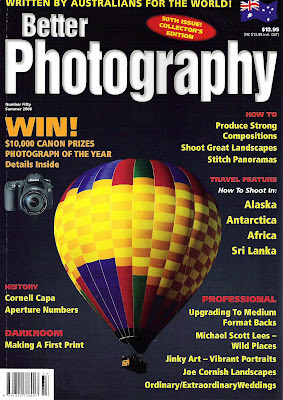 I am once again honoured to be among the editorial contributors for Better Photography magazine. This is the 50th issue of the magazine and its great to know that I have been a regular contributor for many of those. In this issue my article deals with the Dominance and Subordination and no, its not a piece on how to maintain a happy marriage! 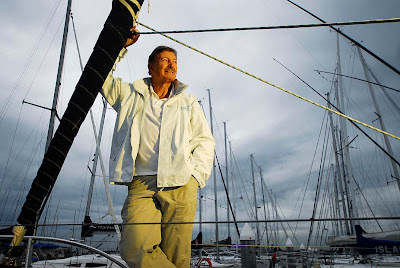 Peter Eastway, the editor, called me the other day with another request. 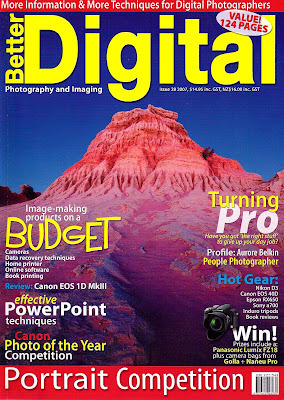 He has now asked me to contribute to another well known magazine in Australia, Better Digital. That phone call was followed up by one from the magazine's editor, Robin Nichols, whom I have also known for several years. It seems I have twenty pages of editorial to contribute before the end of January! So, I will be busy over the next month. But it is an honour to be asked to write for Better Digital, and I am looking forward to hopefully joining the ranks of its regular contributors also. Once upon a time turning up for a shoot with a flash gun as your only other source of light (apart from the available or ambient) was looked upon as very unprofessional - especially if it was a commercial shoot. However, that has all changed. Today was proof enough. I arrived for the early shoot a few minutes before schedule. 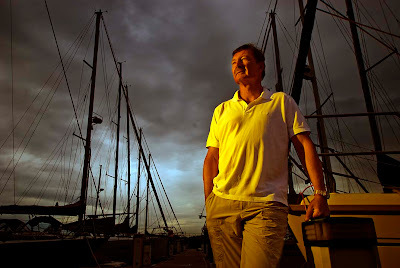 I had to be at the Royal Brighton Yacht club to photograph renowned yachtsman and philanthropist, John Bertrand. John and I had worked together before but I don't blame him for being the only one of the two of us who remembered. It was years ago anyway and he has worked with hundreds of photographers since then no doubt! We were hoping for some early morning light, the kind that glows and warms the coast of Victoria on beautiful summer mornings. However, this was a Melbourne morning, and it was very cloudy. It was time to make my own sunrise. So, once again my off-camera flash with ten cents of orange cellophane and an elastic band was my salvation. I had the second art director hold the flash and stand where I directed him for each shot. Using Nikon's incredible I-TTL flash system I simply shot away as directed. I do love working with this kind of simple but highly effective equipment. Its fast, accruate and very effective indeed. Why would you encumber yourself with large lights and stands if you don't have to? My clients were far more impressed with my ability to produce a large variety of images with less time and hassle. So, yes, slowly but surely, I am becoming a Strobist! Well, again it must be said that there is value in persistence. 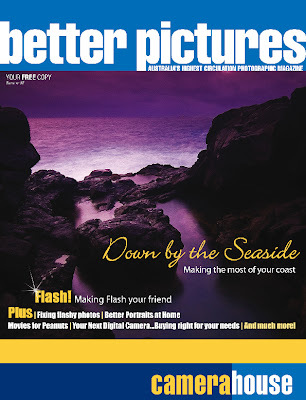 The latest issues of Total Image and Better Pictures are out now. So, if you are in Australia, grab yourself a copy. 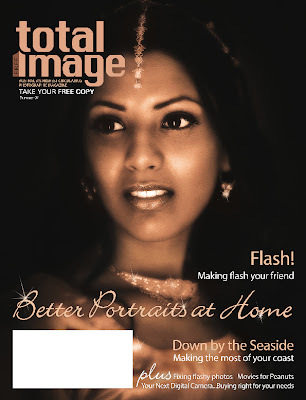 In this issue we help you understand flash, shoot Summer Weddings and better Seascapes.The Total Image cover is an image from a an Indian/Muslim wedding I photographed a couple of years ago. The bride's name is Zaffira. The Better Pictures cover was taken by Greg Beyer while he was with us on our annual photography trip which this year was held in Portland, Victoria. Greg has provided me with many cover images over the years. So! Its out and its free. Grab your copy today! 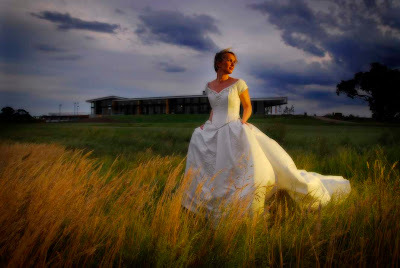 The assignment was to create an image for Settlers Run Golf Club to attract prospective wedding clients. We didn't have much time (that's always the way of it) and so a shoot was set up for Sunday night. The images were needed Monday morning...of course. 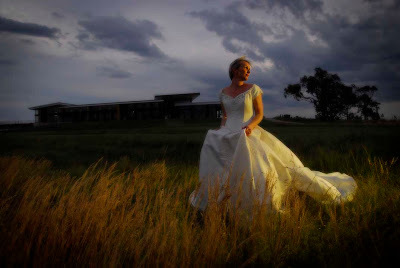 I have a wedding dress for my workshops, so that was fine. We just needed a model that would fit. Ngaire Wallace, who works at Settlers Run, was ideal. Now, I am always a little skeptical when I am told that 'one of the people who works here' is going to be the model. But Ngaire was fantastic! Not only did she fit the dress, but she was attractive and easy to work with. I set up the shoot for 7pm so I would get the evening light. But there was none. So, I set up an off camera flash and used about ten cents worth of orange cellophane to create the idea of sunset. Thankfully it worked. Ngaire and worked together for about an hour, then had a well-earned beer inside the clubhouse. The images were then processed and uploaded. I have fallen in love with Nikon's i-ttl flash system. This is yet another occasion when it made life so much easier for me. Sometimes things happen in the most unusual ways. Danielle and Jeff's wedding is one of these interesting series of coincidences that is just a little too 'out there' for me to ponder. Danielle found me as a result of a Google search. Danielle is a professional Auslan (Australian Sign Language) interpreter. While going through my Wedding Gallery on my website, she saw a picture I had taken of two people she knew - a deaf couple named Walter and Jennie, whose wedding I photographed a few years ago. So, now she knows I am, as she puts it, 'deaf friendly'. I am actually fairly fluent in Auslan myself. 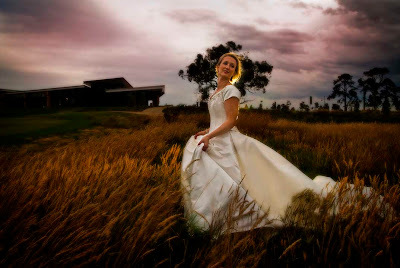 Then, she sees a dress worn by another bride I photographed a few years ago - namely Lauretta Lane. Lauretta is the wife of my very good friend and fellow photographer, Greg Beyer. Lauretta's dress was unique, and Danielle had already been in touch with the dress designer repsonsible for it. It was this, and a few other things that made Danielle and Jeff's wedding a very interesting event for me. Sometimes, events from the past combine to form events of the present, and the future, in ways you cannot predict.